Born in a small Ferelden village to parents only very recently emigrated from the Anderfels, _ Antek was a holy terror from the day he was born. Witty, charismatic and charming even as a child, __ was never without friends and always seemed happiest when somewhere near the center of a social group. It wasn't a bad life, though it was (in some ways) incredibly dull. Young __ often found himself daydreaming of far-off places and dashing adventures, but he was to discover all too soon that reality is never quite so pleasant. At the age of twelve, he was helping his father to harness their plow mare when a sneeze of all things accidentally caught the barn on fire. Culture in the Anderfels was not so universally strict in such things as elsewhere in Thedas. His mother gave thought to nothing but protecting her son; his father, however… his father was afraid and fear is a terrible thing. Over the next few weeks, __ watched his father become sullen, distant - as jumpy as if any moment he expected his death to come through the door. His mother managed to forestall the inevitable for almost three months, but in the end, the Templars came. They led a boy away in handcuffs - clutching only his mother's pillow in his hands - and his father couldn't even look him in the eye. That was his eldest boy taken off in chains like a criminal and it was his own doing. It was the last time __ ever saw his family and the memory was blurred by tears. Life in the Circle did not suit __. He was a creature of wide open spaces and few limitations. The cloistered existence forced on the mages was suffocating. He couldn't even speak for fear the air would choke him and it went on so long that they gave him a name of their own. Anders, for he was the Ander. His first escape attempt was only six months after being brought to Kinloch Hold and when asked why, he told Enchanter Irving the truth; he just wanted to go home. His second attempt was better-executed. He made it as far as the forest behind his childhood home and when he crested the final hill he'd almost cried in relief… but it was short lived. The house was empty, the barn abandoned, the fields lay fallow. There was no sign that he or his family had ever been there at all. The visceral experience of hard evidence that he no longer had a home - that he perhaps had never really had one - hit him hard, but the worst of it was that he did not understand why. In darker moments, he wondered if perhaps it had been his father's fear of him - of some future retribution - that had motivated their escape. He wondered if it was possible that he really was such a monster. The Templars found him sitting on the shore of Lake Calenhad staring blankly into the middle distance. He did not fight them this time. After that, the boy withdrew into himself, bitter and hurting and angry at the whole world for making him hurt. He accepted the name Anders, made it his own. __, he reasoned, was dead and gone. It was a downward spiral made worse by the onset of teenage hormones and could have gone in a very bad way for him. But sometimes Fate is… not exactly kind, but providential. With Karl Thekla's arrival in the Circle it was like a breath of fresh air. Karl was a fair bit older than Anders, but that was alright as far as Anders was concerned. He was quiet and warm and safe, with a sharp wit, a brilliant mind and a wicked tongue revealed only on much closer acquaintance. Anders was head over heels in love with him before he even knew what head over heels meant. 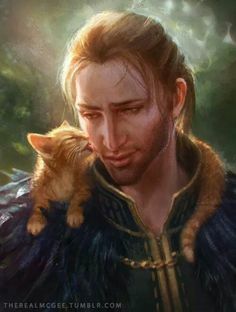 They were absolutely inseparable and for three glorious years Anders was about as close to happy as he'd ever been. But it didn't have the makings of a happily ever after. Karl was quite a bit older than Anders and while Maker only knows there were any number of injustices that First Enchanter Irving could do nothing about, a teenage boy taken advantage of by a man old enough to know better… well, that he could and would correct. And when those people who considered the boy a friend (the elven mage Taevan and the damnable Cousland girl among them) brought forward their concerns, he had no choice but to act. Anders, however, didn't understand. He was young and convinced he was in love and the removal of his only solace to Kirkwall of all places seemed like the worst sort of punishment for seemingly no reason other than to torment him. Within a month, the escape attempts resumed. For a while, life fell back into old patterns. Anders ran, the Templars brought him back, he was punished, he recovered, he made a new attempt. It was maddening to Greagoir, who saw only a rebellious time bomb looking for any excuse to blow. The second to last time Anders ever ran from the Kinloch Circle, the Knight Commander decided it was high time to break him once and for all - and to provide an example for all mages who may have harbored thoughts of running. They locked him up in solitary confinement for a whole year. It was, without a doubt, the worst year of Anders' life. He began to question things - then he began to question everything. Was it really right to want freedom? Had Karl really loved him? Was his name really Anders? Did he really even exist? The crushing dark silence was broken only by three specific events. One: Mister Wiggums, the tower mouser. Two: Merida bullying her way down into the cells the moment she heard and insisting on her and Taevan spending the entirety of her visit down there with him. Three: The occasional talkative Templar, some of which were kind - like Cullen who snuck him sweets from the kitchen and letters from Tae and Merida when he could, or Cenn who snuck him books to try and help pull his mind away from dangerous waters - but some were… not so much. In the end, that year did many things to Anders, but most of all it made him certain that he would have his freedom or he would have death; no longer was he willing to accept any other compromise. Amaranthine was an enormous disaster. He hadn't meant to get tangled up in the Wardens - all he'd wanted was his phylactery to destroy and then he'd be off to Kirkwall - but Warden Commander Sidona was a force of nature that not even King Alistair seemed capable of gainsaying. Not that he was in the mood to gainsay much. He'd kept looking at Anders funny ever since he heard his name and even when Sidona seemed perfectly content to let him die, he continued to press the issue. 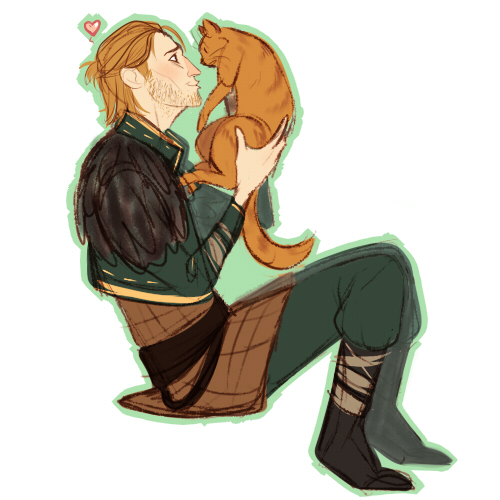 It wasn't until much later that Anders figured out he probably had Taevan and Merida to thank for that, too. The Joining was exactly as horrific as expected; he had half expected never to wake up again. And after that? Well, things went spectacularly downhill from there. It was bad enough when Adeline was there, fighting Sidona every step of the way until tensions in the Keep were at an unbearable high. When Adeline left, however, things only got worse. Anders hated her a little bit for being able to leave. He didn't like Sidona; the woman was the elven equivalent of a spider queen - and often was a spider queen. Just being around her made him physically uncomfortable, but while she had possession of his phylactery, she had possession of him and they both knew it. Her insistance on attempting to work with the creepy talking Darkspawn and setting fire to a whole town full of people was bad enough - there were plenty of things that happened under her command about which Anders would be haunted for a long time - but the fact that she punished him for questioning by killing the cat that was his best comfort (that had been a gift from her in the first place) was the final straw. When Justice stood in the way of her scheming and she cut him down, Anders was faced with a terrible choice; stand back once again and let someone else - someone he'd counted a friend - die, or accept an invasion that went against every instinct at his core. Wracked with guilt over all of the terrible things he had done nothing to prevent, Anders made a foolish decision. He took the Spirit of Justice into himself and became a Host. It wasn't very much longer before he disappeared for good. Sidona still has his phylactery, but a man has his limits and he's put off Kirkwall - and Karl - long enough.